These Maple Roasted Brussels sprouts are my favorite holiday side dish. 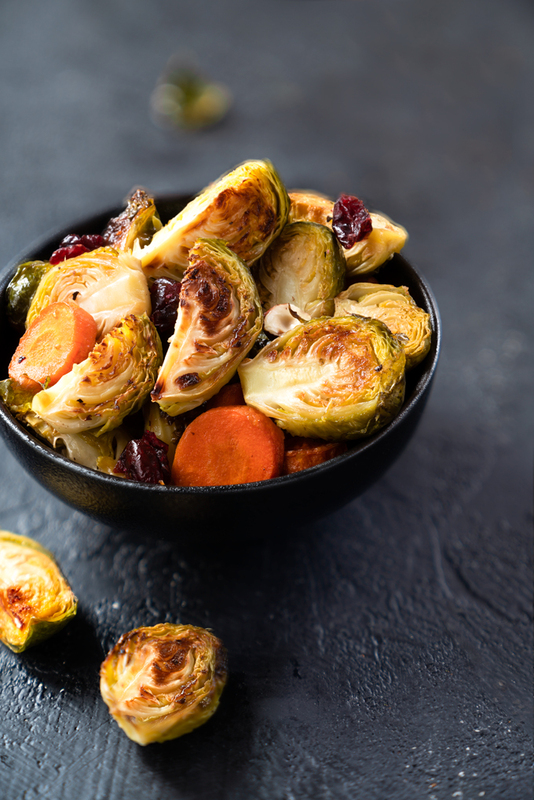 Caramelized Brussels sprouts, roasted hazelnuts, and tart cranberries – this dish can convert even a die hard veggie hater. “Tanner, eat your Brussels sprouts!” is what my husband recalls when he thinks back to his childhood memories of eating vegetables at a dinner table. What a funny thing, childhood memories. The sad truth is that many adults had a traumatic experience with Brussels sprouts while growing up and have written them off as adults. If that’s you, I dare you to try these Maple Roasted Brussels Sprouts with Hazelnuts. You’ll be fighting for the last one on the plate, I promise. Admittedly, Brussels sprouts have probably the worst reputation of any vegetable. In fact, when I was buying Brussels sprouts for this recipe, I accidentally dumped the whole bag of sprouts on the floor, right in front of the cashier as he was about to ring them in. As I started chasing those little cabbages rolling around everywhere, he said, “just go get some new ones, nobody likes Brussels sprouts anyway”. I get it. Brussels sprouts can taste (and smell!) pretty terrible if not prepared properly. The solution? Prepare them properly! Pick Brussels sprouts that are firm and heavy for their size. The leaves should be bright green and tightly compacted. Avoid Brussels sprouts with yellowing leaves, a sign of age, or black spots, which could indicate fungus. Smaller sprouts tend to be sweeter-tasting and more tender, while larger sprouts are more cabbage-like. Another essential ingredient is olive oil. A light drizzle of oil does a few things. For one, it encourages extra browning and creates a richer, toastier flavor. A little bit of oil also helps the vegetables roast much more evenly than they do without oil, and keeps them from drying out. Use enough to give the vegetables a glossy coating, but not so much that the vegetables are swimming in oil. I usually toss the vegetables with my hands, so I can rub the oil into the vegetables and make sure they have an even coating. While roasted Brussels sprouts taste amazing on their own, I like to dress them up a bit. Brussels sprouts are a very savory vegetable, so I usually pair them with some sweet vegetable, such as carrots or sweet potatoes. 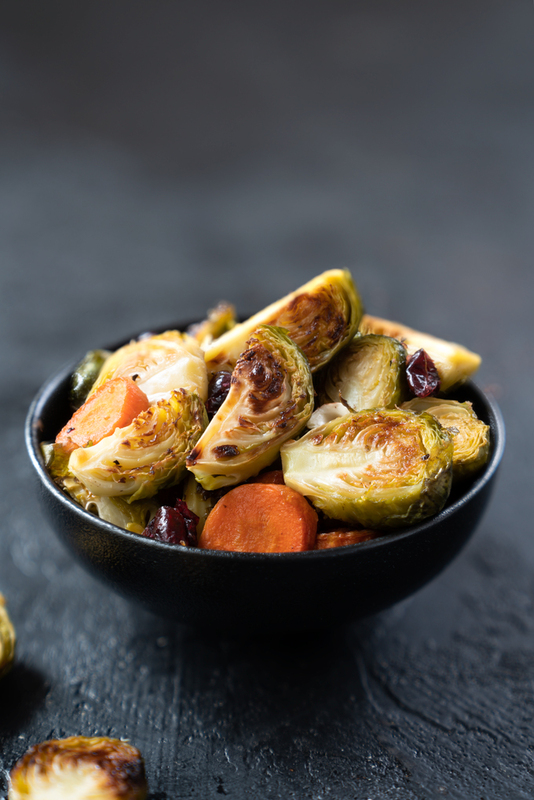 A drizzle of maple syrup boosts Brussels sprouts’ caramelizing potential as they roast, while also offsetting their slight cabbage-like flavor. Finally, the nutty flavor and crunchy texture of roasted hazelnuts just take the Maple Roasted Brussels sprouts to a whole new level. These Maple Roasted Brussels Sprouts with Hazelnuts are a sure way to convert even lifelong Brussels sprouts haters. 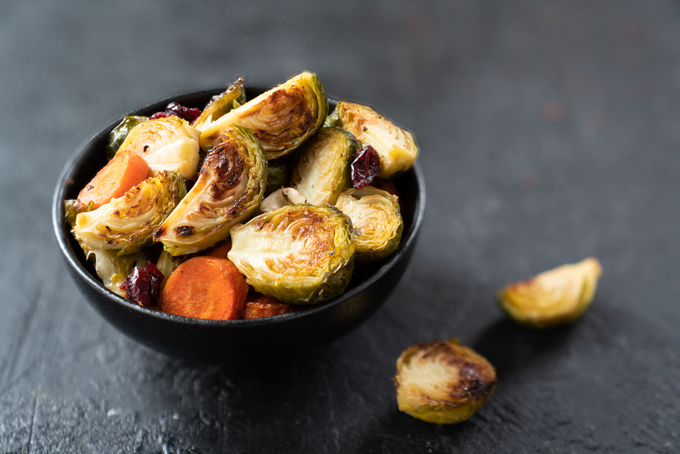 The trick to making Brussels sprouts taste incredible is to roast the Brussels sprouts instead of boiling or steaming them. Traditionally, Brussels sprouts have always been boiled, which is a recipe for disaster. It takes away all their flavor and doesn’t give them a great texture. Roasting, on the other hand, caramelizes the Brussels sprouts and brings out their rich sweetness. Roasting also creates a crisp exterior with a creamy delicious inside. You might be tempted to try to fit as many veggies on the baking sheet as possible. However, when the veggies are pushed up next to one another, or worse yet, in a double layer, they steam rather than roast. As they cook, vegetables give off moisture, and when arranged too close together it results in a soggy outcome. To achieve beautiful browning and crisp, roasted perfection, vegetables need some breathing room. So, arrange the Brussels sprouts in a single layer and don’t overcrowd the pan. Keeping an eye on the Brussels sprouts as they’re roasting is so important because Brussels sprouts contain natural compounds called glucosinolates, which are actually really good for you. However, they also release a lot of sulfur the longer they cook. That’s why overcooked Brussels sprouts taste and smell terrible. To reduce the sulfur taste and smell as much as possible, keep every Brussels sprout under 1 1/2″ (3.8 cm) in diameter. Yes, that means you might need to cut them in half. The bigger the Brussels sprouts are, the longer it will take them to cook. By the time the center is be done, the outside will be overcooked. For the same reason, keep all your Brussels sprouts approximately the same size. Finally, roasting isn’t a set-it-and-forget-it method of cooking. Forget to flip the vegetables, and they’ll end up unevenly cooked, with one side that’s deep brown (or burnt), while the other has no color. It’s best to flip the veggies at least once during the roasting process. These maple-roasted Brussels sprouts with cranberries and toasted hazelnuts are naturally sweet with caramelized, crispy edges and a creamy inside. Prepare the Brussels sprouts: remove any brown and yellow outer leaves and cut off the tough stems. Cut the Brussels sprouts in half and slice the carrots. The carrots should be approximately the same size as the Brussels sprouts. Place the Brussels sprouts and the carrots in a baking dish. Drizzle them with olive oil and maple syrup, and sprinkle them with salt and pepper. Toss and spread all the veggies evenly into a single layer. Roast in the oven for 15 minutes. Remove the Brussels sprouts from the oven and add the hazelnuts. Roast until the vegetables begin to caramelize and brown, for about 10 minutes. Remove from the oven. 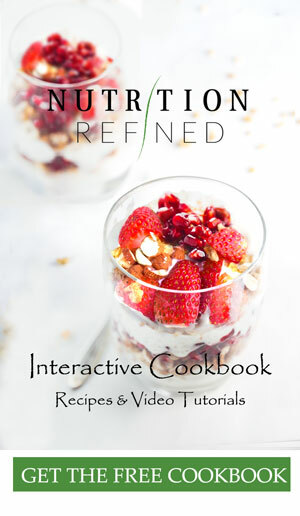 Stir in the cranberries and enjoy immediately. Store leftover Brussels sprouts covered in the refrigerator for a few days, though best when fresh. Reheat in a 325°F (165°C) oven. You don’t need high temperatures to reheat the food because the vegetables have already been cooked and you don’t want them to dry out. Check the temperature every 5-10 minutes. *Bring a medium-size pan of water to a boil. Only fill the pot half way. Once boiling, add 3 Tbsp. (54 g) of baking soda (the pot will bubble up) and the hazelnuts. Let the nuts boil for about 4 minutes. Then strain the water and rinse the nuts under cold water. Once you start rubbing the skin with your fingers, they should come right off.